Forrester report an emphatic decision by the Supreme Court in the US this week, which has endorsed the fundamental right of the individual to safeguard the privacy of data held on a mobile phone and that the only way for 3rd party agencies to access this, would be to seek a warrant. The sheer variety of applications now available on mobile phones (cameras, video players, Rolodexes, calendars, tape recorders, libraries, diaries, albums, televisions, maps, newspapers, forums etc.) reveal much about its owner as well as what can be shown through the browsing history. Consequently it was felt this would give 3rd parties too personal an insight about things we would prefer to keep private, even from our partners. The crossover impact for this in business is in BYOD where corporate employers may not yet have taken steps to assess and implement data security policies to safeguard corporate privacy. With the increase of devices and wearable technology, much of the content will inevitably be stored in the Cloud and what is not revealed through the phone as its conduit, will be accessible once it hits storage sites like Dropbox, Evernote etc. So as soon as you have connected, you are no longer able to control that privacy, or that right. This ruling is insufficient therefore in the wider context of cloud content and management of personal (and customer data), so expect more rulings in future as the further legal ramifications are reviewed. As an MSP, it is your responsibility to be a privacy advocate. Stop thief – you are turning me off! Research by Glasgow Caledonian University into the way we hold and use smartphones, is leading to a new form of security being developed, to identify abnormal patterns which could trigger a “kill switch”. The software logs, monitors and profiles “normal” behaviour, carriage mannerisms, application access and timing, plus geolocation and browsing. Subtle changes to this information could indicate unauthorised use and prompt a shut down. The profiles take a few days of average use to build up a coherent picture and current versions of logging software are detecting illegal use within a couple of minutes which will no doubt get far quicker. Lead scientist, Professor Lynn Baille notes that a further development of this software could be in authenticating identity. Research indicates users wiping or tapping in their pin up to 100 times a day to unlock their handset, which for some users is putting them off using security measures, if they have that choice. This new software could sanction access simply because the device is “in the right hands” and keeps a phone unlocked in normal use, except where a user needed to purchase something, or log in to a corporate network. Yet again, there are implications about privacy for such monitoring and whether this is managed centrally, or locally on the device. A new report fielding results from over 850 Euro technology decision makers, has identified 72% of Euro businesses acknowledge they face a moderate or significant tech deficit as they weigh up their commercial plans against their ability to support their existing IT infrastructure. The research marks a change in outlook as 76% of companies are seeing suppliers more as partners. In addition to this, 63% saw benefits in using providers with a range of IT service and infrastructure solution offerings, creating a complete portfolio of solutions, as opposed to businesses relying on a chain of individual suppliers. Most prominent on the shopping list for priority tech resolution in the next 2 years were: voice and communications (88%), data centre infrastructure (90%) and network infrastructure (85%). The researchers found that the use of a service based model would become more important, with IaaS, SaaS and data centre colocation to increase resilience, expected to grow by 52%, 55% and 33% respectively. The report also identified a growing preference for simplicity and automation in organisations’ infrastructure to safeguard future development and growth, whilst maintaining flexibility and seeking OPEX vs CAPEX outlay – all of which will be a more attractive sell to the board. There is a clear steer for progressive IT managed service providers to respond with intelligent mapping of best in market supplier partnerships and match the diverse requirements of their customer base to ensure highest standards of governance to wrap the complete offering as their trusted advisor. Microsoft Research has been developing machine learning technologies for some time now. The technology is a branch of artificial intelligence utilised to complete complex computing tasks. Microsoft uses this tech to help power Xbox Live, Bing and has worked with its partners so they can also take advantage of machine learning. However this comes in the form of complex, physical infrastructure work. Now, Microsoft has announced it is bringing machine learning to its Azure Cloud to combat this issue. “Soon, machine learning will help to drastically reduce wait times in emergency rooms, predict disease outbreaks and predict and prevent crime. To realize that future, we need to make machine learning more accessible – to every enterprise and, over time, everyone,” wrote Joseph Sirosh, corporate VP of Machine Learning, on the Microsoft blog. The public launch of the service is expected to hit next month for Azure users, so they can also take advantage of artificial intelligence based computing. Real-time computer simulations determining diagnosis, treatment and prevention of disease are at the heart of a groundbreaking new book, “Computational Biomedicine: Modelling the Human Body”. The authors advocate that drugs will soon be selected on the basis of a patient’s “digital profile”, with treatments tailored accordingly and that clinical decisions made in the UK’s operating theatres will be determined by such technology by the end of the century. The speed of technological advances is altering what historically would have been purely hypothetical research, into real time plans in healthcare according to author, Professor Pete Coveney. In parallel, 123 academics and clinicians working under the collective name, the Insigneo Institute, are working on a major EC backed project called “Virtual Physiological Human”, a computerised replica of the human body that allows virtual testing of treatments on patients, based on their own specific needs. Whilst a virtual human is still a long way off, scientists have recently used images of a patient’s heart to build virtual arteries from which predictions for most effective operations can be made. Separately, one of Professor Coveney’s colleagues is modelling the blood flow in a patient’s brain and relying on the UK’s most powerful supercomputer at the University of Edinburgh, capable of more than a million billion calculations per second. An interesting question of liability pops up with regard to supercomputers themselves, not all of which are in the UK. If a supercomputer in the States made a calculation that led to the death of a patient in the UK, could it be held liable? Finally, to make such technological advances in virtual medicine happen, vast amounts of patient data is required. However, the spate of NHS data scandals does little to progress the cause. Whilst the arguments against making data available from patient groups and lobbyists is frequently heard (and often with good reason in terms of governance), Professor Coveney argues that individuals are far more receptive to their personal data being used, especially where they have a direct interest as it could offer even a limited chance of finding a cure for them. For medical practitioners and CISOs, these fascinating developments and intriguing prognostications will continue to be voiced and require solutions as governance and the law fight to keep up with each other at the high table of technology. 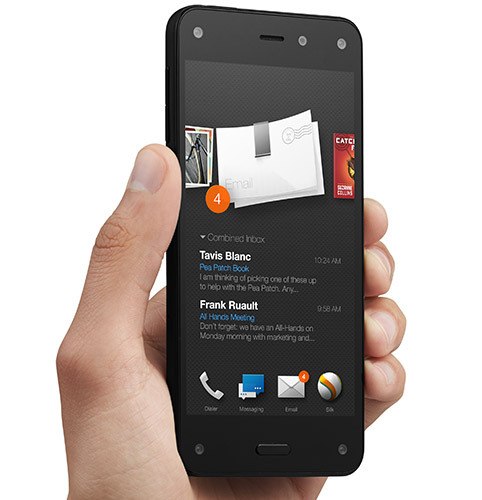 Ever since Amazon successfully entered the tablet space, with a modified Android slab there has been rumours of an Amazon Phone. This week it became a reality, the phone simply being called Fire. Again running on a modified Android platform the main gimmick is how it uses cameras. In addition to the standard snapper on the front and back, there are also 4 other front facing cameras, utilised to detect what angle you are looking at the phone, to create a quasi-3D effect allowing you to see the content on your phone at different angles, not to be mistaken with stereoscopic tech which simulates depth. The phone also includes a new Amazon service called Firefly, after pressing the dedicated button, the phone looks and listens and if you point it at an ad in real life, you can tap on a phone number or web address. If it can hear music, a TV show or a movie, it can show relevant info and of course a button to buy from the Amazon store. There are also some other special features, including Mayday, Amazon’s live-video tech support which should be handy for first time smart phone buyers who lose their way. Despite some clever tech under the hood, it is clear that this is a product which unlike Google, Apple and Microsoft will not also be competing for the office space, at least yet and is setting its multitude of sights directly at the home. February saw the launch of the Government Digital Service (GDS), aimed at creating a government digital marketplace to include CloudStore (aka G-Cloud) and other digital frameworks. This will form the access point for public sector bodies to view and buy products from approved suppliers, including their Cloud services. This week the Government announced the start of preliminary testing ahead of live user testing in September 2014. The Crown Commercial Service recently stated the current Cloudstore offering was not robust enough to host GDS’s future roll out plans and anticipated traffic and usage. On top of previous confusion due to GDS’s interchangeable use of the “G-Cloud” brand with Cloudstore, it is hoped that by September, the Government’s public sector audience will understand what they are getting from GDS, which is essentially an approved procurement resource point, rather than a separate Cloud service as many thought. Given the confusing marketing presentation thus far, this was always going to be a big ask – however there is still time to get it right and make it consumer friendly… that’s the hope at least. In neural network computing, the use of proactive software agents. These are software applications with the capacity to discern and predict likely future needs for its patient/consumer. They also include intelligent meeting scheduling, sorting email and selectively notifying the user of changes. Scientifically viable today; mainstream in 2016; financially viable in 2017. Another such tool is predictive crime prevention. This involves the use of sociometric sensors coupled with neural networked computers to statistically determine the probability of crime (or other anti-social behaviour) taking place before it happens. Scientifically viable in 2021; mainstream in 2026; financially viable in 2027. Then there is neural network image recognition, using hundreds of thousands of processor cores programmed to algorithmically determine the content of a given image and different from reverse image search. A next generation biometrics scanner possibly? Scientifically viable today; mainstream in 2021; financially viable in 2022. In extended cognition, the use of neuroprosthetics has been marked out. These are neural devices capable of substituting motor, sensory or cognitive behaviours which might have been damaged as a result of injury or disease. Scientifically viable in 2021; mainstream in 2026; financially viable in 2027. In neural interfaces, EEG brain-to-computer interfaces: the almost unpronounceable “electroencephalography” remains the most feasible practice of executing and implementing brain to brain interfaces. It represents the best temporal-resolution tool for getting a picture of the brain in action, is portable, non-invasive and extremely affordable compared to other methods. Scientifically viable and mainstream today; financially viable in 2021. And finally… next-generation brain-to-computer interfaces. These involve hypothetical interfaces for assisting, augmenting, or repairing human cognitive or sensory-motor functions and communicating thoughts and intentions to the Internet. Scientifically viable in 2020; mainstream in 2022; financially viable in 2027. Are you ready to handle growing mobile app data? Many of us now use mobile apps as part of our daily routine, we feed them information frequently, and we are not alone. Creators and supporters of mobile apps need to have the capacity to handle huge amounts of data, especially if the user base balloons into the next must-have-app. Gartner recently revealed “most mobile apps will sync, collect and analyse deep data about users and their social graphs”’ by 2015. Organisations supporting these apps will need to be prepared. Gartner advices IT leaders need to begin to manage this data as part of an organizations information infrastructure. A hybrid approach of both on premise and cloud storage will be required, with careful consideration applied to make sure you have a cloud partner that can adapt as fast as needed to avoid user frustration as consumers are unable to use their latest app because of storage limitations. Malwarebytes, the U.S Company popular for the anti-malware application it provides of the same name has announced a new product which promises zero-day protection against virtual attacks. The application has been in development by ZeroVulnerabilityLabs founded by ex-Panda Security software engineer, Pedro Bustamente, a start-up Malwarebytes picked up last year. The products unique claims is it will be able to block both known exploits but also ones yet to be discovered. We will be monitoring the software closely going forwards, as surely this is a case of something a bit too good to be true. Gartner’s newly released report has failed to include Microsoft this year for Enterprise Mobility Management (“EMM”). Gartner say this is strictly based on Microsoft not meeting their business metrics and technical capabilities. Microsoft acknowledge it was a matter of timing as they only launched Windows InTune in Autumn 2013 and the window to the EMM Magic Quadrant in January 2014 was too short a proving space. With an Enterprise Mobility Suite combination of Windows Intune (for MDM and mobile application management), Microsoft Azure Rights Management and Microsoft Azure Active Directory Premium, Microsoft were confident it presented quite a strong offering. Gartner commented: “”The offering has promise, but Microsoft must drive adoption and demonstrate that it can meet enterprise requirements.” Microsoft remains confident it will be firmly in the “zone” next year. Mobile network giant Vodafone currently operates across 29 countries worldwide. Despite the majority of countries having legal process requirements for warrants to be submitted should law enforcers or intelligence agencies wish to intercept communications, the BBC has established there are six governments which have a permanent link to monitor their communications. Vodafone will not name the six countries, but the disclosure has emerged as new transparency efforts are being made by telecoms companies between their customers and governments. Data privacy is a theme regularly in the news following US whistleblower Edward Snowden’s leaks and his influence in causing telecoms and governments to offer more transparency. Liberty director, Shami Chakrabarti described news of the ease of access “unprecedented and terrifying”. However, the main difficulty in making meaningful comparisons are the different laws operating in each country and a lack of willingness to discuss the issue. Whatever the outcome, the net effect is to reinforce broad customer distrust against government and major corporates wherever personal data is held. Samsung is the TOP Android manufacturer, pushing out more Android smartphones than anyone else. No-one else comes close. In fact with Android leading the Smartphone OS race, Samsung jumping ship would stir up the whole industry. Samsung has been developing its own smartphone OS called “Tizen” over the last few years and is finally ready to put it on their next Smartphone, the Samsung “Z”. Samsung with its Galaxy line has been building up huge brand recognition, arguable more than the Android name itself, if they were to put Tizen on their next flagship Galaxy phone and tablet instead of Android, Tizen would likely get the stab in the arm needed to make it a viable platform going forwards. How hard Samsung pushes their own Tizen over Google’s Android on their devices will be interesting to watch going forwards. As tempting as it must be for them to switch everything over to Tizen – they would likely frustrate users if the software didn’t match Android’s feature set, so they will have to walk a careful tightrope act between the two until Tizen reaches feature parity. If however Samsung does play its card’s right, it not impossible to imagine a future where Samsung can beat Google at their own game. The mission to find an alternative power source for storing electrical energy created by wind and solar power on windless and cloudy days, may just have got a step nearer. 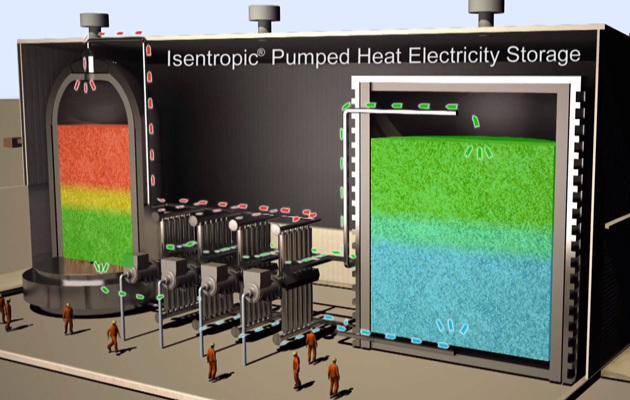 British company Isentropic has developed a system using a gravel-filled silo with Argon gas. Using a heat-exchange pump it drives an engine to create the power needed for the grid. Despite a 75% efficiency for the system, this energy solution may be a very intelligent one as it is low cost, easy to install and argon gas is highly available (being the third most abundant gas in the planet and 23 times more abundant than carbon dioxide). More ideas like this are desperately needed if we are to successfully service an increasingly power-hungry world – and all the better when sometimes it is not a high tech solution that captures headlines.